We met Earl on a nice day in June. He had come into the shelter as a stray and was a sweet, big old bear. After some digging, the shelter contacted his owners, who advised the shelter that they no longer wanted their dog, for whatever reason. While this is sad, we do not know the circumstances, and this short story is not about them. This is about Earl. We are writing this story because though Earl was not with us long, he left a hole in our hearts and we miss him everyday. And we feel it is important for people to see Earl’s picture and to read his short story. His story is short, not because of a lack of time to write a longer one, but because Earl’s time with us was too short. If you feel these last few lines are foreshadowing some sadness, you are correct. Back to that day in June. It was nice out, he was a big bear and he was lovely. The kind of dog you can cuddle with and get lost in his fur. The kind of dog that legitimately feels like a human listening quietly to your hopes and your crushes. The kind of dog that sleeps next to the table and waits for the signal to come on in and clean the floor. He was the best big boy you could conjure up. Or at least, that’s what he showed us. We wanted to take him that first day we met, but the shelter had received a call from his people that they might be able to come in and get him. 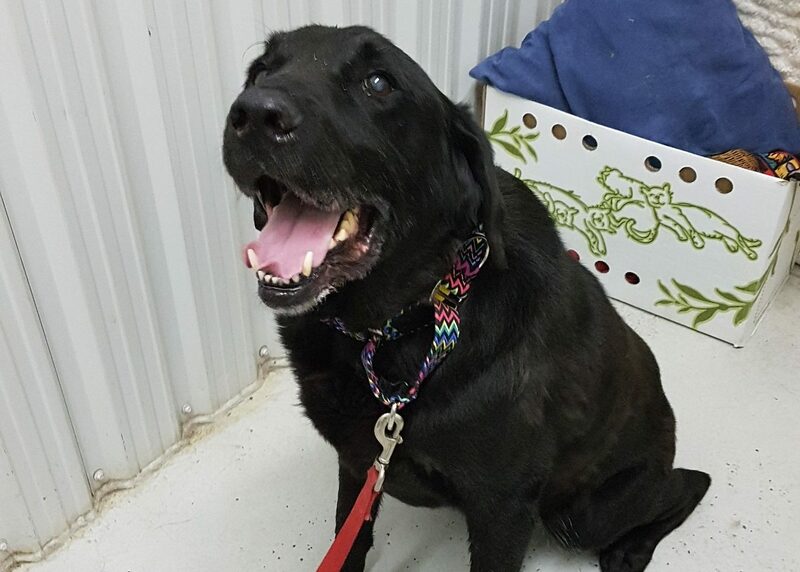 While we knew that Earl was eager to leave the shelter, we also had many other dogs in need that day, and so we took the next most senior and overwhelmed girl we could, and Verona came home with us that day. We let the shelter know our intentions to return for Earl should the family be unable to come for him. We wanted to ensure he was safe. We gave him a kiss as he barked at our backs, and we left the shelter with 2 happy dogs that day. Fast forward to the next morning. Earl crashed overnight. The happy and bouncy boy was no more. He was lethargic and unwell. We decided to take vacation, and as soon as we are given the green light to come and pick him up – as his previous family had decided they could not come and get him – we drive in. Our hearts are broken at the view into his kennel. He is flat, on the floor, and does not even look up. We get sentimental and wonder if this is what a broken heart looks like. We also feel like maybe we should have pushed to take him the day before. When in rescue you often second guess yourself, because you are dealing with so many emergency situations that are life and death. It weighs on you. We coax the big guy to his feet. We see inaction from his tail. We sign his papers and get him to the car. As he looks back at the shelter, his tail wags before he jumps into the car. Earl. You’re still in there, aren’t you? We head to the vet. As we get to the vet, Earl’s spirit seems better. He is lifting his head a bit more. He even takes a treat or 2. But he’s still not great. So we do a list of tests, x-rays, and we get some plausible ideas for how to help him. He may have a blood disorder and so we start him up on medication and we head home with our handsome boy. Over the next few days, we get to know this lug a bit better and we get to see the greatness that is Earl. He is happy, energetic at times and even pushy when it comes to wanting attention. He nudges to get his pets. But we do not do too much with him as we want him to get better. Unfortunately, it never happens. Twice more, Earl crashes without explanation. And on the final time, he is rushed into emergency in horrible pain. That’s when we knew had to say goodbye. To put it simply, Earl likely had a tumour that burst and he was bleeding out. Our happy boy’s days were numbered all along and we never knew. There is comfort in knowing he died in the arms of someone who truly loved him and would have gone to the end of the earth for him. We are telling you Earl’s story because rescue is hard sometimes. And the things we do behind the scenes are not always known. We sure do have lots of great and happy times when we are able to help a dog, get them to health and then find them their forever homes. But sometimes, there is quite a bit of sadness that wraps around the happiness too, because quite honestly, there has to be. Saying goodbye is hard when the promises we whisper to them about a happily ever after are not fulfilled in the ways we had hoped. We want our volunteers and foster homes to know that we love you for giving so much of yourself to the dogs. And we want Earl to know that we tried, that he was loved, and that he certainly mattered and deserves to be remembered. All the love to you, Earl. May you have the biggest bounces in tall grass, best left-overs and comfiest of cuddles wherever you may be. Reading the sad story of Earl reminded me so much of our beloved Kobe who passed away last August 31. His sister Jasmine had passed in June from cancer and for a while Kobe was in mourning, despite her constant dominance over him. Then we noticed that Kobe was getting listless, had stopped eating and seemed generally unwell. A trip to the vet was unsettling as our vet Lori seemed to feel that he was bleeding internally and therefore was feeling full even when he hadn’t eaten. We decided we would take him home and see how things progressed as the belly tap procedure was very painful and invasive. For a few weeks he seemed to be back to his old self, running and playing in his enclosure. Then in mid August he started going downhill again. This time he became so weak that he could not even negotiate the three steps down to his pen. A second trip to the vet was done and once again Lori said she thought he was bleeding. This time I decided it was time to say goodbye to our dear friend. Lori’s assistant prepared the sedative to calm him prior to the final drug, but almost as the drug was entering his vein, he died. It was if his body had finally had enough. Lori did a belly tap post mortem and determined that he was, in fact bleeding internally, likely from a tumour in his spleen. Kobe, our delightful 105 pound King Shepherd now occupies a place of honor quite near to his sister in our side yard. I am considering some kind of marker but can’t seem to come up with any ideas. Maybe in the spring. In the meantime my wife and I are halfheartedly looking for another dog to treasure. Given our ages (we are both senior citizens) I can’t see us being able to start at the puppy stage again although recent news articles may sway us back again. I can’t understand why someone would give up such a sweet boy, seems like anyone would want the chance to love him. His story hurts the heart so much but thankfully he was loved and cared for when he needed it most. Thank you for all you do. Wow, this story was hard to read as my beautiful black lab, Sam just passed away at age 13 from hemangiosarcoma (bleed out of spleen) . He had the heart and soul of Earl as well, they sound so much alike and I sit here now welling up with the same heart break- I feel as if my heart will never heal.